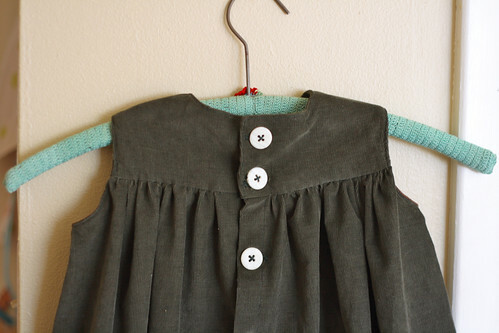 Also for last Christmas, I made this dress for my little niece. It was actually a design I'd had in mind for a couple of years (originally, I'd thought of making it for a friend -- who is James's age -- when she was two or three), but it took me a long time to get from the idea to the making. The pictures are just awful, taken moments before wrapping it up, and you can see the imprint of my ironing board on the fabric. I wanted to get some better pictures with my niece wearing the dress, but in reality, I don't think she ever wore it. People have such different taste and one lesson I've learned is that you have to let go of things when you gift them. You can't control how a gift will be received, whether it's a handmade Christmas gift, or even the gift of parenting a child to adulthood. You just have to let it go, know that you gave your best, and let them choose how to receive it. So, no hard feelings on the dress. Anyway, it's a very fine-wale, lovely deep green corduroy; so soft. I used a vintage dress pattern (I'm sorry, I don't know which one, but there are tons of little empire-waisted vintage dress patterns out there) as a basic shape for the pattern, and then I made a few changes, primarily to the front of the dress, with the asymmetrical pleat. 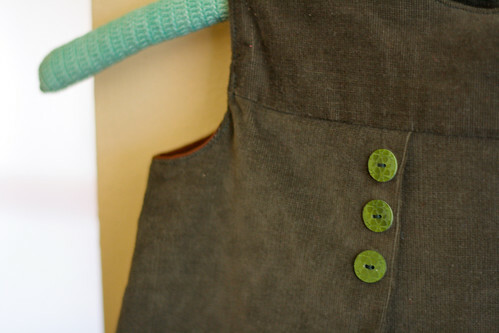 This was the particular design element I'd had in mind for the dress for years, along with the three buttons on the pleat. 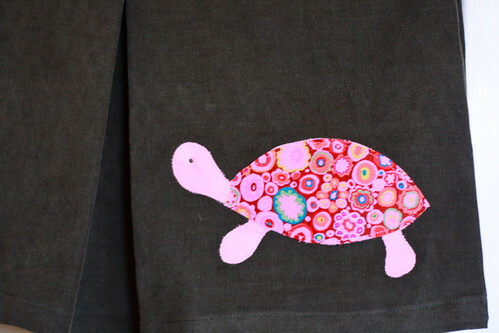 I added a pink turtle applique (Kaffe Fasset Paperweight print), and then vintage buttons down the back. 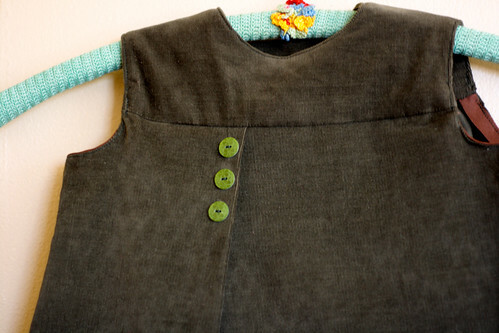 I wanted to do the back closure differently, with a placket, but in the end, there was some reason (I can't remember) why I ended up going with buttons all the way down the back. I also finished the inside of the armscyes with that hideous brown bias tape, because I didn't have any other on hand and didn't feel like making self-bias binding. (I did make this on Christmas morning ... there were time constraints going on.) I hoped the dress would look cute with a long-sleeved t-shirt and tights under it, so of course, you would never have seen the bias binding. Anyway, I was really happy with the overall look and design of this dress, and very pleased with many of the small design elements. I wish that better photos existed of it, but as I said, some things you just let go. And, truly, I'd rather that than buying a pile of plastic toys that will end up in a landfill in a month or a year. I really am glad I unearthed these photos tonight, though. 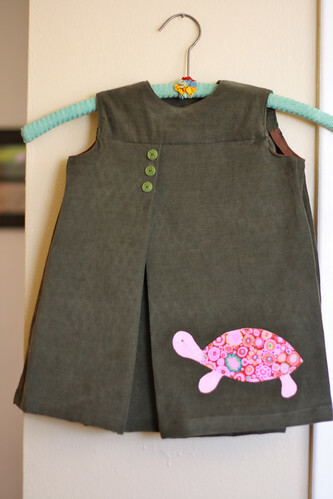 What a fun little dress to dream up!